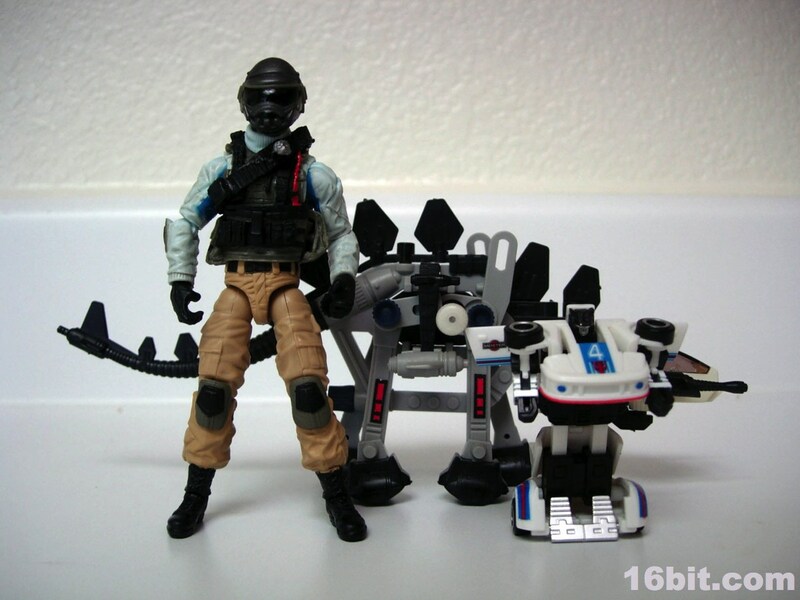 I blame kits like the Gorgodos and Twinhorn kits as being part of the reason I stuck with this line-- both were picked up in Japan by my dad at some point after 1987, and as you can see, I took pretty good care of these guys. As one of the earlier kits, you can tell it's a very simple, skeletal design. The Helic Republic symbol is on the side of the head, and foil stickers on the legs bring out a little detail. It's molded in black, grey, and an off-white plastic for the head with blue twist-bolts keeping it together, while the motor is the usual black box with a white knob. Twist the knob, and the legs will scoot along the table. 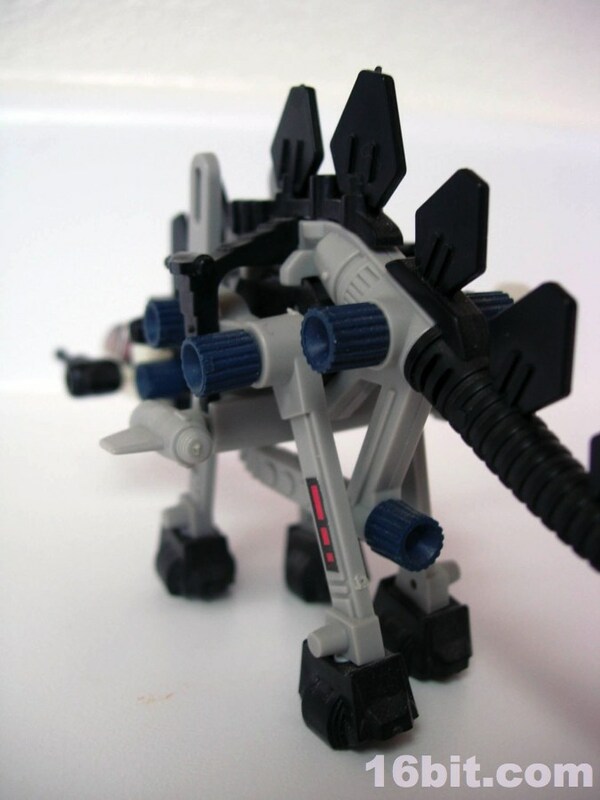 Standing about 7-inches long, this Zoids kit was one of the smaller and simpler release, and I'm pretty sure it predated the notion of there being an opposing empire for them to fight. 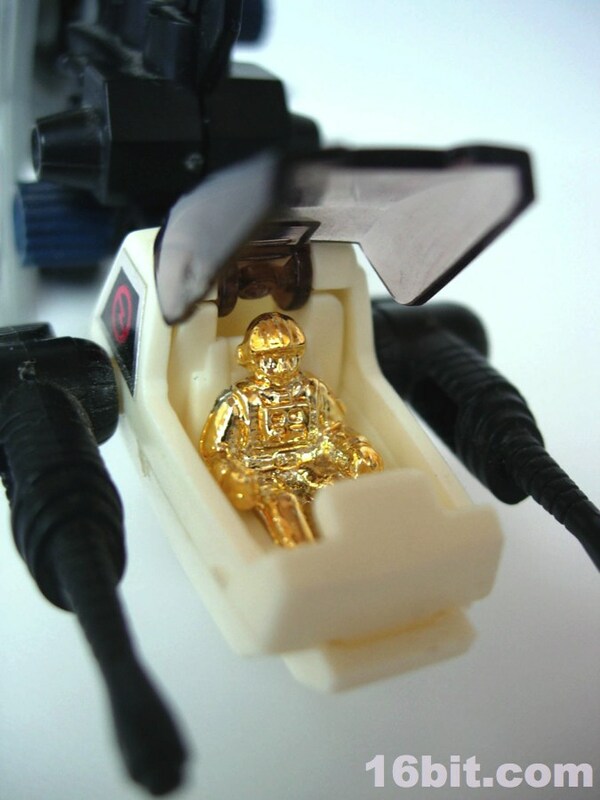 Of course, it wasn't too early to include a vacuum-metalized pilot figure, which in this case was a golden driver. 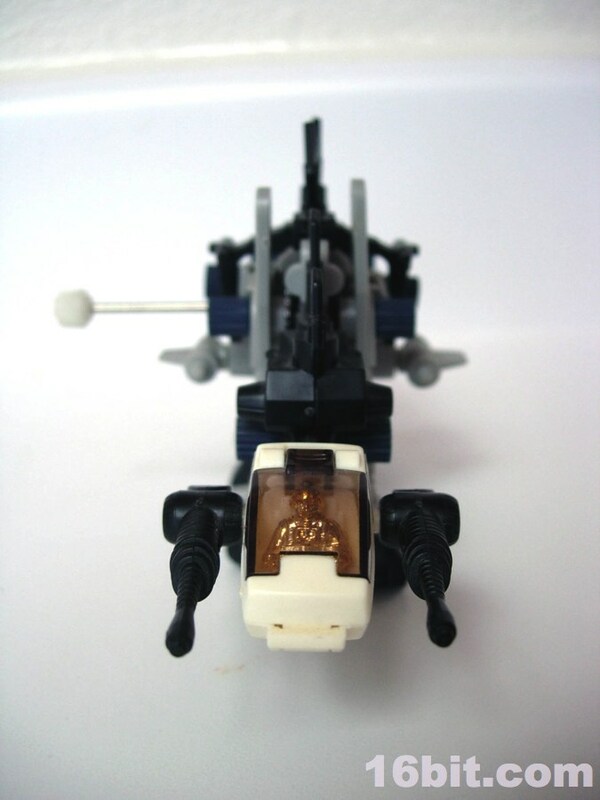 Little details like a gun on his tail and guns with fins appear on his side, with blasters on the side of the canopy (to deaden the driver, I assume) but there aren't a lot of play features on this guy. Well, beyond the fact it was essentially a model kit you had to assemble and it's also a wind-up toy. 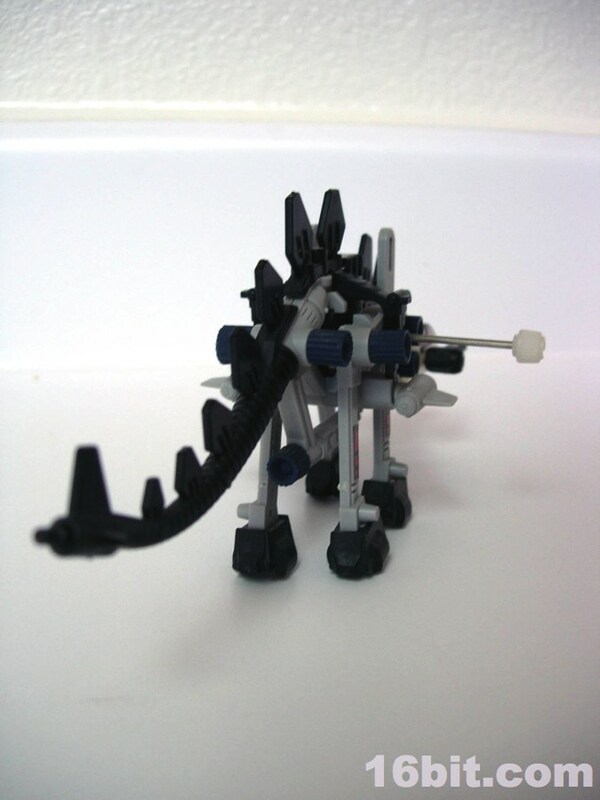 This toy doesn't take long to assemble, and given what would follow-- towering beasts with electronic lights and more-- it's not much to look at. Heck, compared to the wind-up kits of 1986, which had armor plating and more guns, it's a little simple. It's cute though, and it shows the evolution of the line from its beginnings (and Gorgodos is certainly an early draft of the concept). Several larger Stegosaurus toys would come later, like the Gorhecks and and large (and awesome looking) Gordos in 1984. 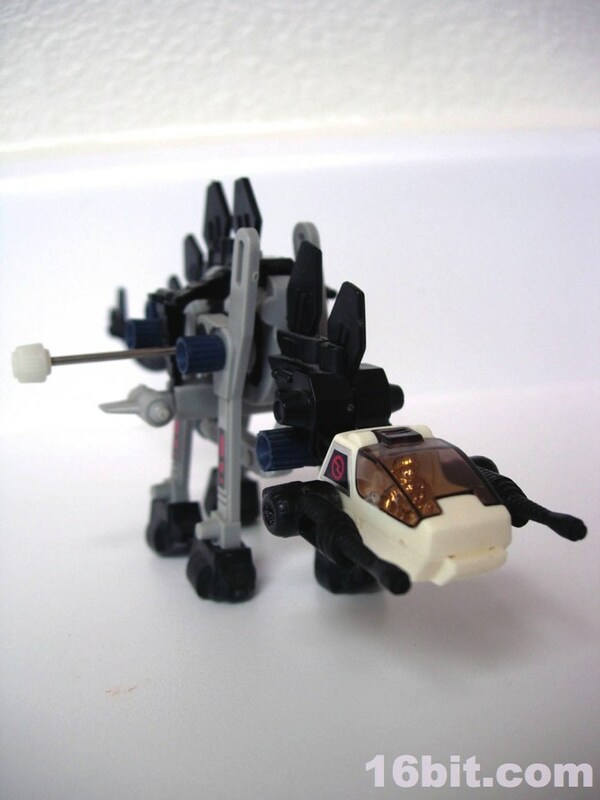 Other versions: This toy was released in Europe as the "Stegazoid", was rereleased as part of a Zoids Memorial boxed set, and I believe a super-deformed pull-pack version exists but I can't seem to find a picture of the catalogs right now. A super-tiny Gorgodos was released as a Gashapon toy in part 7 of that series in the 2000s, but in the classic colors. 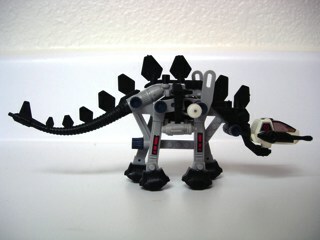 He was paired with Elephantus, who shares some of his construction. 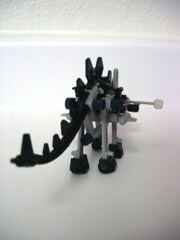 Actually, quite a few of the earlier Zoids do... Hidocker, for example.